First of all, ServiceMaster Recovery Services would like to thank you for choosing us as your fire damage repair service. 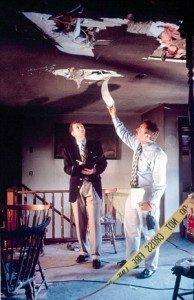 We understand that discovering fire damage is deeply traumatic and when seeing your property left in severe condition, you may not know where to turn. However, we guarantee to work with you throughout the entire restoration process from start to finish. While this may be your first large loss, our technicians have been restoring damage from property fires for over 40 years. Our experience has helped us improve the quality of our services in regards to advancing our methods and techniques. In addition, our technicians undergo advance training in order to remain updated in all of the latest techniques, equipment, and cleaning trends. While we understand that you want your property restored as soon as possible, we highly recommend to not attempt any “do-it-yourself” cleaning methods without notifying your technician. Any improper cleaning products or techniques can actually worsen the damage. As there are complex chemical reactions and hidden damage that occur when combined with cleaning products, our technicians are knowledgeable in using the proper cleaning product for the specific surface. 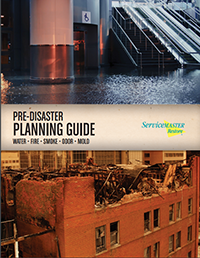 Did you know that there are numerous steps to take in order to prevent fire damage? Check out these simple tips in order to see how you can save you and your family from a huge headache in the future. As smoke is driven by the heat created by the flames of the fire, it will penetrate through any building material, causing severe damage to the structural composition of your property. It can also mix with the moisture in the air while forming corrosive residues that can cause permanent damage. Even after the fire has been extinguished, any smoke that remains on the property will settle onto the affected surfaces and household items. In addition to the fire burning, residual smoke can also burn. This is commonly known as chemical burning, etching, or pitting. In this case, immediate treatment is crucial. Finally, the more time that passes between treatment and when the damage was caused, the higher the risk for permanent damage. ServiceMaster Recovery Services is a professional, licensed, and insured disaster restoration company, specializing in fire damage restoration services. We have years of experience in addition to our ongoing training programs that our technicians attend on a regular basis; they are knowledgeable in fire mitigation, corrosion control, restoration systems, and more. We also require that they attend continuing education in order to remain updated in the latest restoration trends, products, and equipment. This is to continue providing you with quality emergency services when you need it most. While it is our goal to restore your home or business building as efficiently and effectively as possible, please keep in mind that depending on the extent of the damage, some properties may take longer than others. 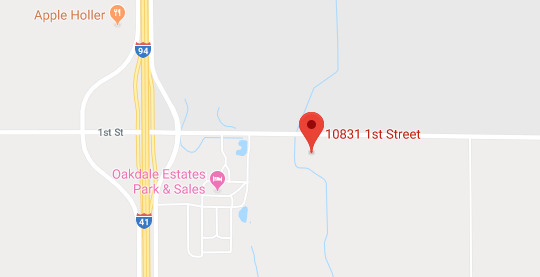 This will depend highly upon the size, source, and extent of the fire damage. Finally, please note that the fire restoration may require several steps before completion. You can also refer to our checklist of fire damage repair services to get a better idea of what may be required to restore your home or commercial building. If at any time you have questions regarding our fire restoration services, you can check out our fire damage cleanup FAQ. Here you can have your general questions answered in regards to our procedures. For information regarding your property in particular, you can also ask your fire restoration technician as they are knowledgeable of which techniques and services to use for your property.